Rabbit anti Bovine, Canine, Equine, Guinea Pig, Human, Mouse, Porcine, Rabbit, Rat KCNH7. 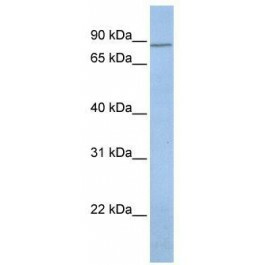 The immunogen for anti-KCNH7 antibody: synthetic peptide directed towards the N terminal of human KCNH7. Synthetic peptide located within the following region: PILPIKTVNRKFFGFKFPGLRVLTYRKQSLPQEDPDVVVIDSSKHSDDSV. Voltage-gated potassium (Kv) channels represent the most complex class of voltage-gated ion channels from both functiol and structural standpoints. Their diverse functions include regulating neurotransmitter release, heart rate, insulin secretion, neurol excitability, epithelial electrolyte transport, smooth muscle contraction, and cell volume. This gene encodes a member of the potassium channel, voltage-gated, subfamily H. This member is a pore-forming (alpha) subunit. There are at least two altertively spliced transcript variants derived from this gene and encoding distinct isoforms. [provided by RefSeq, Jul 2008].